Back when I worked at a Christian college, I had the joy of adopting several students. These students have been major blessings and encouragements to me. It has been wonderful to see them mature in the Lord, have families, buy homes and begin ministries. I want to introduce you to one of my adopted sons, Jake Heath and his wife Cayton. I stole this off of their blog and I didn't even ask permission. I hope they will forgive me. I am betting they will. I haven't had the chance to spend a lot of time with Cayton, but I am hoping that will change once the two of them move across country and are closer to me. Jake loves her, she loves him and together they love the Lord. That makes her special to me. Jake I have had the pleasure of spending lots of time with and look forward to spending much more if the Lord wills. My young friend Jake was in my office one day while I happened to be chatting to my sister either by email or on the phone, I don't remember which. She was trying to talk me into moving from California to Kentucky. Jake, the kind of person who likes to work and help folks, said that he would drive me across country because among his many talents, he is a truck driver. Little did he know that a couple of months later I would ask him if he would do just that. He took a week off work and drove a 26' Uhaul truck 2600 miles across country in the dead of winter. He also helped to coordinate help to load the truck.... in the snow... and I am not just trying to be funny. It snowed while we loaded all my belongings. We had an amazing adventure with lots of stories to tell. I really hated to put him on a airplane to head back to California. He's just that likable. Jake and Cayton are being called to be missionaries with MMS Aviation. They are raising money for their support and I would love it if you would pray for them. If you had a few bucks you could send them each month, that would be great too. You see, Jake is the sort of young man who graduated college and went straight to work to pay off student loans. He knew what he wanted to do and has worked hard to get there. 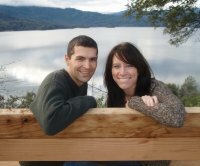 He found the love of his life and wanted to be debt free before they married. He's wise beyond his years, works harder than most, is goal oriented and wants to help missionaries get where they are going by working on the planes that get them there. He's never had to depend on other people to fill his coffers so this is a new experience and a new way to trust in Almighty God to provide. Jake and Cayton are at a point where Jake needs to quit work, find their final bit of support and start making their way across country. Please pray for them. They are leaving family, friends and the comforts of having work- to go out and ask for support. Pray that they make the transition with the courage and faith only Christ can give. Pray for their wisdom and opportunities to share their hearts and vision for their ministries. If the Lord leads you to support them in ministry, you can do that on the MMS Aviation page here. I really covet your prayers for them, that they would serve to His honor and glory and not grow discouraged as they ask for support in this lean economy. giving to missionaries Jake and Cayton Heath MMS Aviation praying for missionaries. Labels: giving to missionaries Jake and Cayton Heath MMS Aviation praying for missionaries.